All the members of K-pop band ITZY are in their late teens, except one girl. JYP Entertainment, the management agency of sensational K-pop girl band TWICE, unveiled today its new girl band ITZY, a group of five girl-crushing members. ITZY is the latest in JYP's successful girl band series, which began with Wonder Girls and culminated in TWICE. JYP dropped a teaser video of the new girl band, "Prologue film: ITZY? ITZY!," on its YouTube channel and other social media accounts today, Yonhap reports. 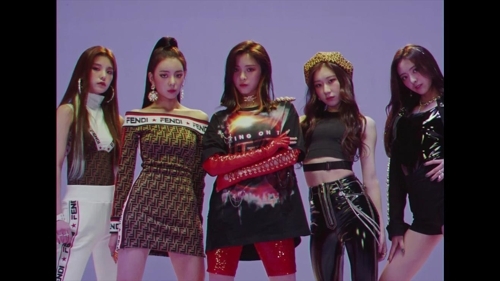 The 70-second video showed the five members -- Yuna, Ryujin, Chaeryeong, Lia and Yeji -- one by one, wearing bold jewelry, patent leather, studded jacket, and athleisure fashion. All the members are in their late teens, except Yuna who is 16. The girls wielded stage props like a hammer, rifle and grenade, adding a funky vibe to the video. Four of the members are already known on the K-pop scene through TV and on-line shows, including Ryujin, who finished as the top winner of the 2018 JTBC idol competition show "MIXNINE." Member Chaeryeong is a sister of Lee Chae-yeon, a member of Iz One, another girl band which debuted last year. "The five members form a dream team that JYP ambitiously launches for this new year," the agency said. "JYP plans to soon announce (details) of the projects involving ITZT, which is expected to become the center of a typhoon in 2019."